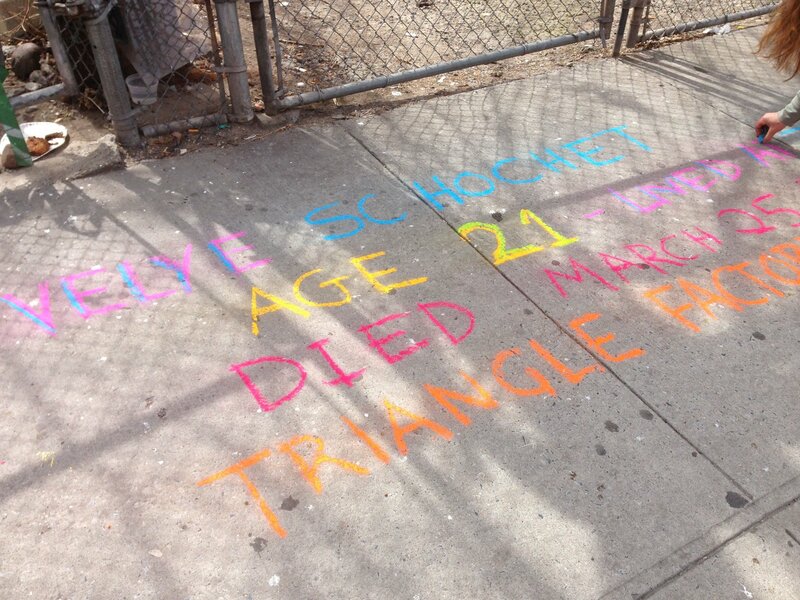 It was last year when I first saw the chalk memorials on the sidewalks. The colorful and almost cheerful lettering screamed from the ground with its details. The age of the victim, young and on the cusp of adulthood. The memorials were written on the sidewalk in front of their former homes. As you stand there and read, you are thinking “she walked out of this very apartment building on her last morning at the start of spring with her whole life ahead of her”. Because of the concentration of immigrants in our neighborhood during the Industrial Revolution, the childlike memorials are everywhere on our streets. Especially sad are the chalk memorials of sisters, where two or even three of the teenagers and young women of the family perished in the fire at the Triangle Waist Factory on March 25, 1911. The fire claimed the lives of 146 garment workers, mostly young women and girls who toiled in unsafe conditions sewing the Gibson Girl shirtwaists that were fashionable at the time. They were the victims of greed. Doors leading to staircases were locked “to prevent theft”. Escape routes were blocked and the firemen’s ladders could not reach them. Many trapped and panicked workers jumped to their deaths from the windows with their hair and clothes ablaze. The tragedy horrified the city and galvanized a movement for worker’s rights. Every year, artist Ruth Sergel organizes volunteers draw the chalk memorials. 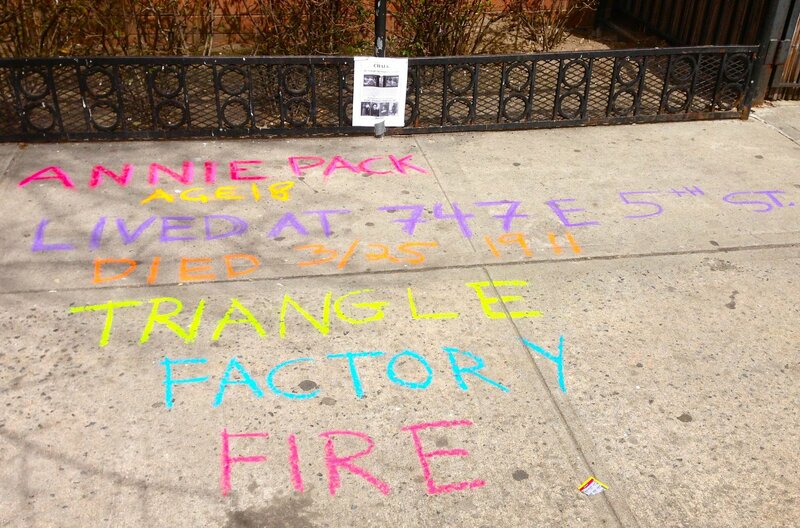 To learn more about the Triangle Waist Company Fire go here. To learn more about the Chalk memorials and to volunteer for 2014 go here. This was my first year participating and these are the memorials my friend Katy and I drew. Ida Pearl, 20 years old was born in Russia. She was a union member. Fannie Rosen, 21 years old. Born in Russia. 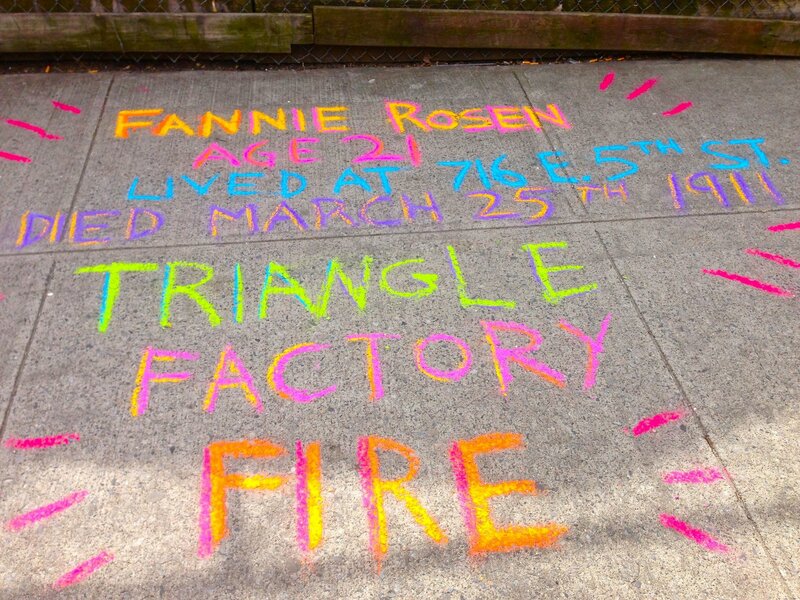 Had started working at the Triangle factory two days earlier. Velye Schochet, 21 years old, was born in Germany. She was a union member. Annie Pack, 18 years old, was born in Austria. She was a union member. 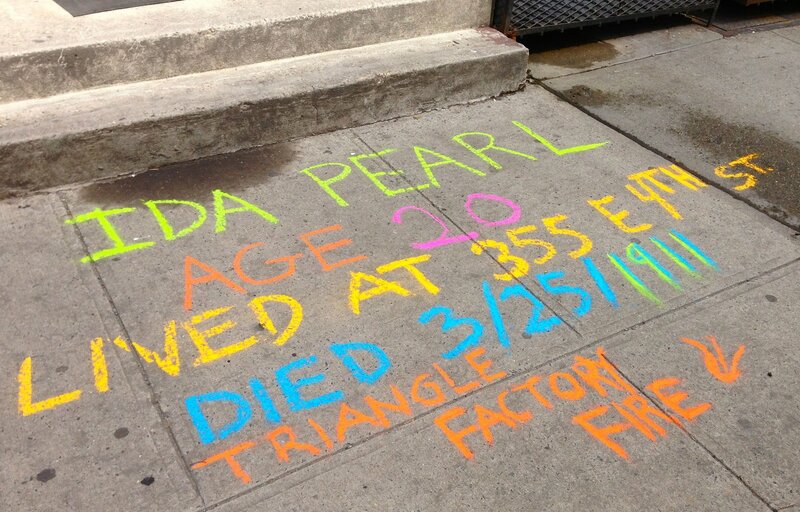 This entry was posted in loisaida - the neighborhood and tagged chalk memorials, chalk project triangle factory fire, triangle shirtwaist factory fire memorials by ileana. Bookmark the permalink. Ileana, what a tragic story but what a beautiful way to make sure that we do not forget. I started following your blog so I could get a glimpse of what you all do in your everyday life and you are certainly enabling me to enjoy your community and to “see” what I never could if I only visited as a tourist. I THANK you for that! Dear Estella, I’m grateful for your loyal readership. Ileana, I just want to tell you I am following your blog with curiosity, I stay silent, but I am here and I enjoy it a lot. Keep it up! Thank you! Dionisio, querido. Thank you for reading.